The Book of Kells is the most famous visitor attraction in Ireland and dates back to 800AD. Its 680 page book illustrates the 4 Gospels all written in Latin. 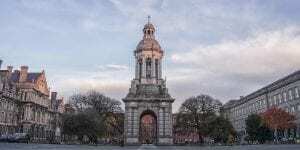 It was later hidden by Irish Monks for fear of Viking raids, but was later rediscovered in 1653 and is now housed in Trinity College. The Book of Kells can be viewed daily and the book changes page once a day. Plan your visit to the Book of Kells and book a stay at Clayton Hotel Leopardstown. Our hotel is located 2 minutes walk from the green Luas line which bring you right into the heart of Dublin city, stopping just past Trinity College Dublin.